When the makers of Rocky Patel and ACID cigars get together to create a cigar, you know it is going to be excellent. This box-pressed, mild to medium cigar maintains a true tobacco taste everyone can enjoy. Java Cigars are made using a combination of espresso and cocoa bean aromas with a mixture of the finest Nicaraguan tobaccos available. Featuring a dark, oily maduro wrapper and an aged blend of Nicaraguan long-fillers, a Java Cigar delivers an inviting aroma and is very relaxing. 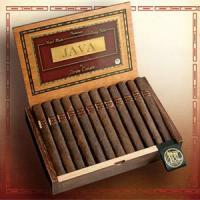 Buy a box of Java by Drew Estate Cigars today and thank us later.